Although not commonplace, understanding what Invalid Clicks are and when they occur is very important. Invalid Clicks are Clicks that Google’s automated system has flagged as being either unintentional or malicious. This can be user error or a deliberate attempt to waste the budget of competitors. Bots and other software can result in Clicks, this is the equivalent of a refund on a substandard product you may have purchased. Manual clicks being used to inflate your cost and drive profits for site owners who are hosting your ads through the Display network. Google automatically filters these Clicks out, removing them from your reporting and billing, meaning that you will not be charged for invalid Clicks. These are not removed from Google Analytics Sessions, which can be a potential contributing factor to discrepancies between the number Clicks and Session. This does not typically include low quality traffic, for example; if you receive thousands of Clicks that have a 99% bounce rate and a conversion rate of 0.1%, this may not qualify as ‘invalid clicks’. Hence Invalid Clicks do not constitute a safety net for poor quality traffic. 1. All clicks are analysed by Google’s system. They analyse click data for suspicious click patterns and if this meets the criteria of an invalid click they will be filtered out before they charge you for them. This also occurs before the invalid clicks reach account reports. 2. This process is repeated a second time and if invalid clicks are identified during this round of checks Google will credit your account. This is visible in your Billing tab as a ‘Click Quality Adjustment’. From our experience, we see on average more invalid clicks from Display campaign ads than from Search campaign ads. This difference can be as much as 4 times higher in some cases. Invalid Clicks can be seen at the campaign level only. Go into the campaign tab and click on the “columns” drop down menu (see image below). 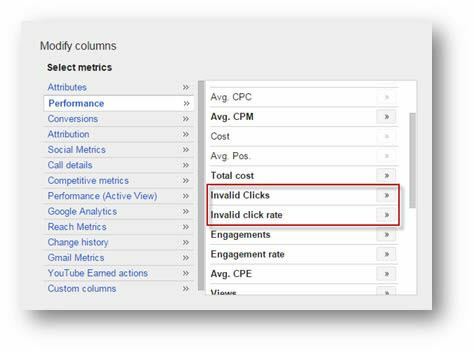 You can either look at Invalid Clicks across all campaigns or you can select a specific campaign and look at the Invalid Clicks for just that campaign.